I really like the rug. I ordered it in the grey and it was a lot darker than the picture shows on the website. 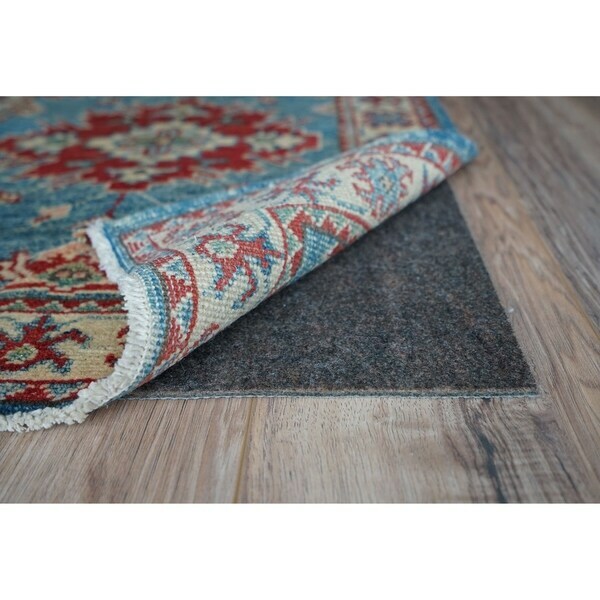 A great addition to any rug, this non-slip cushioned rug pad from CushGrip keeps your rugs from sliding around on even hardwood or tile floors as well as providing comfortable cushioning for your feet. Made of recycled and eco-friendly materials, this rug pad gives you the ability to buy any type of rug you want, knowing that you can keep it secure and comfy. Dimensions 141.0 In. X 117.0 In. X 0.15 In. Miricle Pad, that's what this product should be called. After Easter dinner last year I was a little tipsy and on the second floor of out condo. We have a balcony and when I was yelling at the kids to stop dropping eggs into the fish tank I slipped and fell.20 feet.onto a.rug.with this mat underneath. Well, 20 stiches and a broken pinky toe later I'm fine and back at work,.this mat not only probably saved my life but got me back on my feet just a day after a major fall. Option: Non-Slip - 7'6" x 9'6"
Works well. Very happy with it. 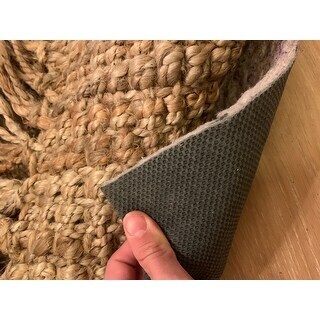 I purchased the CushGrip 1/8-inch Thick Non-Slip Cushioned Felt &amp; Rubber Rug Pad (7'6 ' x 9'6) to go under the Dhurrie Rug. 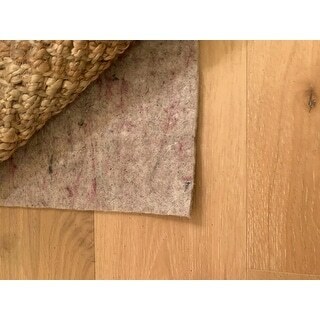 This rug pad is very durable and keeps the rug on top in place. I needed a pad to provide extra padding to the rug as well as keep it from moving, and this pad does both. I use it on a hard wood floor and it works very well. I purchased this pad after doing a lot of online research on the best pad for carpeting or area rugs. I learned that rubber and felt was the absolute best. I was pleased to find that overstock not only had this type of pad but it came in various sizes as well. I needed the 9x12 for the 100% wool area rug I was also purchasing. It shipped pretty quickly. Actually received it a day before the rug. I purchased the 1/8 inch thick because my research also said it was ideal thickness. I put it down by myself. Easy to install. It was just a tad bigger than the area rug but rather easy to trim with a good pair of scissors. My area rug stays put. I'm happy with my purchase and would recommend. Thanks Overstock. I would recommend buying this for any area rug just to make the rug feel more plush. I had to cut it a little bit to fit our 7x10 rug but i am glad there was more rather than less. Great non-slip felt pad for your rug. It isn't too thick but it gives the rug some needed cushioning. Plus the felt grips the rug better than those beaded pads and is easy to cut to size. The felt top grabs onto your rug so well that it is difficult to reposition the rug by pulling on it. You pretty much have to roll the rug out onto the pad and then they stay together very well, which is the point after all. There was no bad smell out of the box and it flattens out pretty quickly. 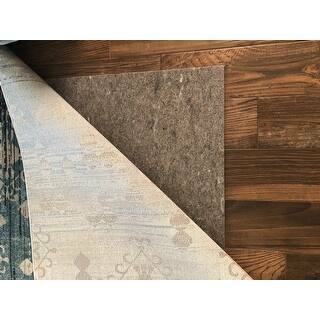 Even though it is only 1/8” thick it actually makes a big difference in the plush feeling of a wool rug underfoot without adding much height or obviously lifting the edge of the rug. When you purchase a nice rug, you want a thick non-slip rug pad and this is it!!! Will always purchase this rug pad! This is a good quality item and at a good price. Does it job well regarding non slip and adds a bit of cushion to the rug. Recommend this pad for rugs in any room. Nice rug pad, it keeps the rug securely in place. I bought the size larger than my rug so that I could trim it to fit perfectly. It adds a nice cushion to the rug but the main part I like is that the rug does not slide around - not even when vacuuming it. I really hesitated to purchase these, but knew with dogs and my carpet on laminate floor they would slide without them. They do the trick, but I should have purchased ones a little thicker. I paid as much for these as the carpets cost. Update one week later..I would not change thickness or they would make the carpet a tripping hazzard. Also I didn't buy pad for the runner. I am going back to do so because the dogs play and cause runner to go everywhere. This is a nice rug pad that lays flat against the floor after unfolding. We had to trim some off so that it would fit our rug but it was easy with sharp scissors. It made our thin rug feel much better underfoot. The rug looks nice online, but in person I felt like it could have been better in material and as for the 1/8 thickness, no. The site rates grip and cushion independently, which helped me pick the perfect pad for our dining room rug. The price was better than anywhere else -- for the IDENTICAL pad -- and delivery even came a day earlier than promised. I'll always check Overstock.com versus other sites for anything Overstock might carry. I'm sold!!! It is very thick and great quality! Perfect for my dining room rug. I bought it to protect my wood floors from my natural fiber rug as well as keep my rug in place. It works great for both purposes! Great purchase, I would buy again. We cut it down a couple inches so our rug would have an inch overhang. It works well! It doesn't slip and it hold the rug giving just enough padding. Great pad. Love the Non-slip surface. I just installed the rug pad a few days ago. So far so good. My only complaint is that I should have ordered the exact size of my rug. It holds the rug in place and provides a great cushing. Works great! For those reviews that say it slips: one side is felt, one side is rubber, put the rubber side down! :) I have the 8x10 size and works well under a woven/rag rug. This rug pad is thick, not like those rubber ones. It holds the rug in place and in shape. I will purchase more to replace all of my old rubber ones. Recommend highly! This is great quality padding. You can feel the cush but it is undetectable. Very pleased. Highly recommend. this has made my family room very comfortable. The thickness has added to the look of the rug I have. "Confused about sizing. What does 8x10-8x10 square mean compared to a 8x10 rectangle? And what does 8 x 10-7'6"x 9'6" rectangle mean? Thank you"
"I am purchasing a 7 x 9 foot oval wool braided rug. DO these pads come in oval sizes? 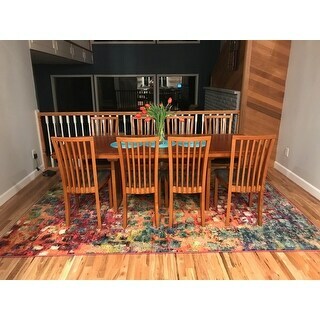 If so what size should I buy to fit my rug? If not can I cut this pad easily? If so what size should I purchase?" "Will the rubber backing stain vinyl floors? Can the pad just be flipped over if so?" That pad is fine for most vinyl floors but we always recommend contacting your flooring company and asking for their recommendations. 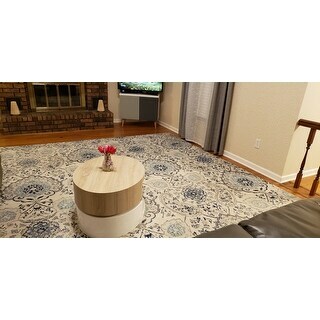 "I'm buying the Safavieh Adirondack Vintage area rug size 8x10 for my basement which has tile flooring. I've never bought a pad before will this size fit a 8x10 rug and will it add a good amount of padding?" "I have a rug 7'10" x 10'10" will this size fit 7'x10'. never bought a pad before. please let me know and I will order this one." A rug overhanging a rug pad is not usually a problem, so yes this size should work for you. The one thing you may want to consider is if your rug is made of an abrasive material like jute the overhang could scratch wood floors. If this is the case you will likely want a larger size rug pad. "Is this pad spill proof or will liquids go through to my engineered hardwood floor? Margaret"
"I have a area rug that measures 6.9x9.3 - what size pad should I get to place under this rug. Rug is being place on hardwood floor." I bought a pad that was a little larger then my rug and then just marked the pad and easily cut it.